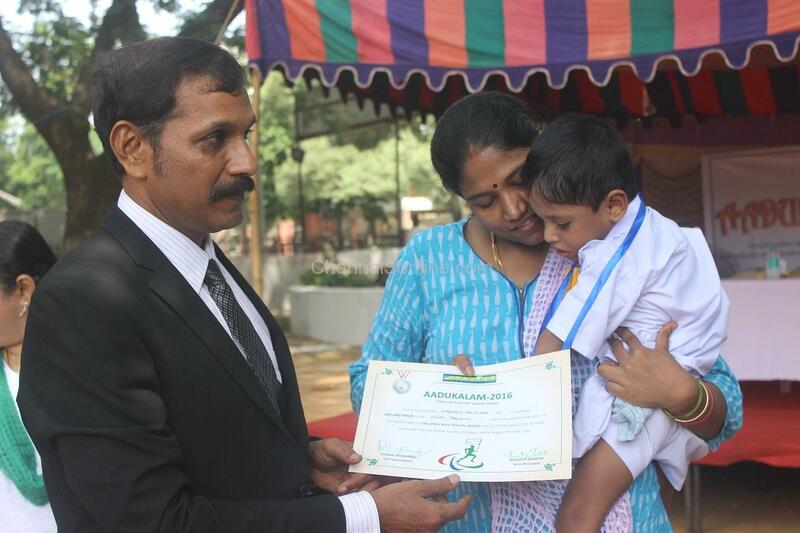 As the curtains were drawn to a close at Rio Olympics, aravind foundation declared open AADUKALAM 2016, 3rd intra center sports meet at The Parade Grounds, Police Training College, Ashok Nagar on August 21st 2016. 100 + children with special needs from our 5 centers participated, displayed their talent and grit in track & off-track events and bagged medals, certificates and won hearts. The event began with the chief Guests Dr. Sylendra Babu IPS, ADGP of the Coastal Guards lighting the traditional kuthu vilakku and declaring the sports meet open. The other dignitaries who graced the occasion were Dr. Arutchelvan – Endocrinologist UK, Anil Kumar Reddy – Industrialist, Prabhakaran Principal – Kendra Vidyalaya Ashok Nagar, Shama Prasanna – President Inner wheel, Siddharth Jayakumar – Manager Trade Operations, Indus Ind Bank, President and Members of Lions Club of Meenam, and Actors Aadhi, Uday, and Ramachandran. There were many field and track events including ball gathering, kicking the ball, running 100 meters (slow/ fast), crawling with / without assistance, identification of body parts, multi-tasking games, assisted walking, sound tracking, visual tracking (for severely challenged), hitting the ball to target etc.. The sports meet is special to all who attend because it showcases the commitment and efforts that teachers and trainers put in to prepare these special needs children. The icing on the cake is the sportsmanship displayed by each child irrespective of their level of “ability” in each of the event. Some of the students won multiple medals proving their mettle in various activities. There were many learning that other people had to learn from these Special Needs Students.